SYmach will host an information session on Friday, April 21st Ballroom G-H from 8 to 11 am and Saturday, April 22nd Ballroom A1 from 9 to 10 am at SARC – Southern Automotive Repair Conference, IP Casino Resort & SPA Ballroom G-H from 8 to 11 am to discuss our solutions for forward thinking owners/operators that are looking to grow their repair capacity in today’s collision repair industry. The discussion will include the Symach DryTronic technology and the exothermic reaction that cures paint in seconds along with the Symach Application Process (SAP) that reduces application time for body filler, primer, waterborne base and clear coats by 50 – 60%. Additionally, we will discuss our unique FixLine, the conveyer repair process that yields touch times of only 0.5 day for 1 panel, 1 day for 2-3 panel and 3 days for 4 plus panel repairs. 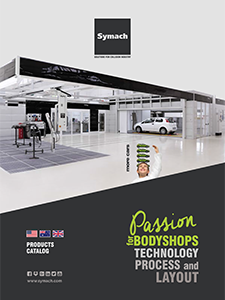 Symach will then walk through the methodology used to develop new body shops around the world and will conclude with a Q&A session. According to event organizers, SARC’s purpose is to provide an annual industry forum for collision repair professionals in the Southeast region, where attendees can visit exhibits, receive important updates and information, stay abreast of new vehicle technologies, promote consumer safety, and succeed in the marketplace. Themes of the event include OEM Perspective, Status of Independent Shops, Training in a Hi-Tech Age, and Innovative Resources.